Let us start by defining ‘a good shot’ by what it is, and what it isn’t. For each individual shooter, any shot which goes within the group area of which the shooter is capable (there is an indication here of difference between the top shooters and the rest of us; top shooters have a consistently smaller grouping area than the rest of us). Consistent procedure for the release of the shot with all the factors that move the shot away from the centre of the group of shots reduced as much as possible. A ‘good’ shot is not necessarily a high scoring shot – a 10.9 might be a perfect score, but be obtained (by luck) as the outcome of a ‘bad’ shot. This may sound strange at first but if for some reason the centre of the group of all a shooter’s shots does not coincide with the centre of the target (e.g. the sights are misaligned) they could all be ‘good’ shots with a comparatively low score value. Any shot which has a placement on the target that is inexplicable by the shooter (whatever its location on the target). This applies irrespective of the misplacement being due to the pistol/ammunition or the shooter, or both. So, what are the components of a ‘good’ shot? In its own way ‘preparation’ is part of some of following sections on ‘no distractions’ and ‘arousal’, but it goes further than that and deserves its own section. If you are serious, it’s not merely a matter of loading and picking up the pistol: your preparation for firing an individual good shot starts MUCH earlier. Your conscious and subconscious brain needs to be concentrated on the task at hand: i.e. achieving a good shot. A balanced stance is how you provide a stable platform for holding the pistol steady and the release of the shot. Your stance needs to (reasonably) natural, balanced with your centre of gravity over the support provided by your feet, have an upright posture, your feet, pelvis and shoulders all in the same alignment with your head upright and the shooting eye within 5° of straight ahead to the target. Your most stable position of the feet is with them approximately as far apart as the across your shoulders and with the feet pointed slightly outwards at the toes. If you observe the stance of the top shooters at a major competition or look at the videos on the ISSF website you will notice that there can be considerable variation in the way these top shooters place their feet: however, without knowing the circumstances affecting the individual shooter you should not assume that any one shooter’s stance is better or worse – e.g. shooters with a background in gymnastics will tend to have a ‘narrower’ foot placement while those with a background in xxxx will tend to have a shooting stance with the feet further apart. For a shooter starting out in the sport the placement of your feet as stated above will be your best option. 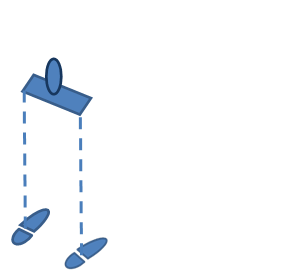 Your toes and heels will define a trapezoid on the floor: ideally in the shooting position with the pistol raised to the target your centre of gravity (CoG) should be over the centre of this trapezoid. When you raise the pistol the weight of the pistol and extended arm will change your centre of gravity – to bring your CoG back to the centre of the trapezoid of your feet you will need to lean back (ever so slightly) in the opposite direction. The best way to achieve this is to spend a session with a 1 or 1.5kg weight in your hand on a balance apparatus or suitably set up ‘Wii fit’. 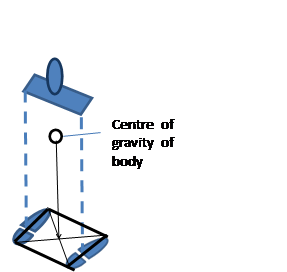 Your weight should be evenly distributed across the front and back of each foot, and evenly distributed between the two feet – more on this in Balanced stance 5 – weight distribution over your feet, but I might as well mention now that your body’s Centre of Gravity will change as you raise the pistol to address the target: the weight of the pistol and your arm in the raised position will shift your Centre of Gravity towards the target. An upright posture without any unnatural strains is recommended. You will feel better, tire less, breathe easier and have better balance. · your feet should be angled slightly and equally outwards. It is of advantage to have somebody else observe your stance and assess these alignments for you – chances are you will not be aware of any misalignments. Your head should be upright and the shooting eye within 5° of looking straight ahead to the sights/target. Unless you are standing face on to the target this will require some sideways twisting of the neck to achieve. 2. Not to have your neck twisted to such degree that the position restricts the flow of blood to the brain or is painful. Balancing these sometimes conflicting requirements can be a problem; less so for the ‘rapid fire’ stages and events, but of major importance for precision stages and events. There is not one ‘perfect’ angle of the body to the target/s that will suit all shooters – this not only varies from shooter to shooter, it can also vary for an individual shooter with the passage of time. There are so many considerations (the type of ‘work’ you do, your build, etc.) 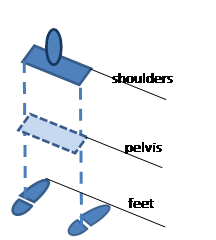 that it is impossible to generalise – that stated, for a shooter beginning in ISSF pistol events it is going to be easier in the long run to start with your feet (pelvis and shoulders) aligned at about 30° to the line to the targets. This 30° can be modified if/as needed as you gain experience in the sport. Balanced cross-training will improve your general condition – recommended are swimming (not butterfly or breast stroke), core strength exercises, flexibility training and walking. Learn how to stand ‘properly’ – your muscles should support your stance, not your bones. Xxxx All that said, there is one pert of your body that improved strength will improve your pistol shooting: your wrists (note the plural – whatever wrist strength exercises you do with the right, do with the left)! You have two natural pauses in your respiration when breathing normally (i.e. sitting or laying down when relaxed): one that occurs when you complete an inhalation phase and one that occurs when you complete an exhalation phase. When completely relaxed, at the completion of each inhalation or exhalation there will be a pause of between ½ and 2 seconds. Neither of these natural pauses occurs anywhere near your maximum inhalation or exhalation, but they are important in providing a balanced and stable platform of your body as at these natural pauses the muscles involved in breathing are relaxed and will not interfere with your stability. Usually precision shots are released at a natural exhalation pause. You can take a slightly larger-than-normal breath to start the breathing sequence - if you find that you take a longish time to release the shot, this slightly larger-than-normal breath will give your blood a bit more oxygen, but with the 'two breath method' and releasing the shot within a few second of getting into the desired aiming area you should not have much need for 'extra' oxygenation. If you have followed this procedure, at first some shots will 'go off' before you are in the desired aiming area( i.e. high); some shots will 'go off' after you have passed below the desired aiming area (i.e. low) - however, with some practice you can shoot lots of 10s with this technique. For the Rapid Fire Pistol and the rapid fire stage of ‘Sport’ and Center Fire Pistol most shooters release the shot/s at a natural exhalation pause (exhaling as the pistol is raised from the READY), though releasing the shots at a natural inhalation pause (inhaling as the pistol is raised from the READY) is equally valid. For the 20-seconds series in Standard Pistol while it is possible to either a) fire all five shots on one respiratory pause, or b) fire each shot after a short breath cycle, neither is advisable. Far more preferable is to ‘break’ the series into 2, 2 and 1 shot. For the first shot in the series, follow the breathing synchronisation set out for the first shot in a 20-seconds series, above. For the Rapid Fire Stage of 25m Womens and Center Fire Pistol the 10-seconds shot cycle (3 seconds facing and 7 seconds away) suits most shooters as a breathing cycle. Hyperventilation – breathing more deeply and/or faster than normal to increase the amount of oxygen and decrease the amount of CO2 in your blood – can be a two-edged sword. Hyperventilation can, but does not necessarily always cause symptoms such as numbness or tingling in the hands, feet and lips, lightheadedness, dizziness, headache, chest pain, slurred speech, nervous laughter, and sometimes fainting. reduces the carbon dioxide concentration of the blood to below its normal level because one is expiring more carbon dioxide than being produced in the body, thereby raising the blood's pH value (making it more alkaline), initiating constriction of the blood vessels which supply the brain, and preventing the transport of oxygen and other molecules necessary for the function of the nervous system. At the same time, hypocapnia causes a higher affinity of oxygen to haemoglobin, known as the Bohr effect further reducing the amount of oxygen that is made available to the brain. The shot (or series) is nowhere near over merely because the projectile has left the barrel on its way to the target! I am using ‘pistol’ in its generic form, referring to a pistol or revolver.